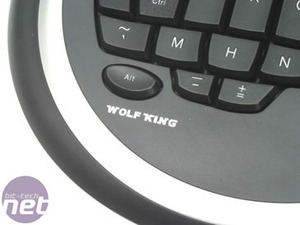 The Wolf King Warrior is the follow-up product to the Timberwolf gaming keyboard, which impressed us with its gaming capabilities, but disappointed us with its all-round functionality as an all purpose keyboard. Wolf King thinks it has fixed that now by implementing the most low-tech of possible solutions. The company has, simply, cut off the entire keyboard part of the device and left users with what it calls the ‘Circle of Death’. Can the remaining gamepad prove to be as useful as its big brother was, or will we still find a way to be disappointed with the Warrior? More importantly, does the Warrior provide decent value for money, and can it actually improve in-game performance? Let’s find out. The Wolf King Warrior arrived on our desks in a package similar to its big brother the Timberwolf and, to be perfectly blunt, it didn’t fill us with an enormous amount of confidence. Just like the Timberwolf, it looks more than a little tacky with the head of a CG wolf badly Photoshopped on to the body of a man holding a gun. 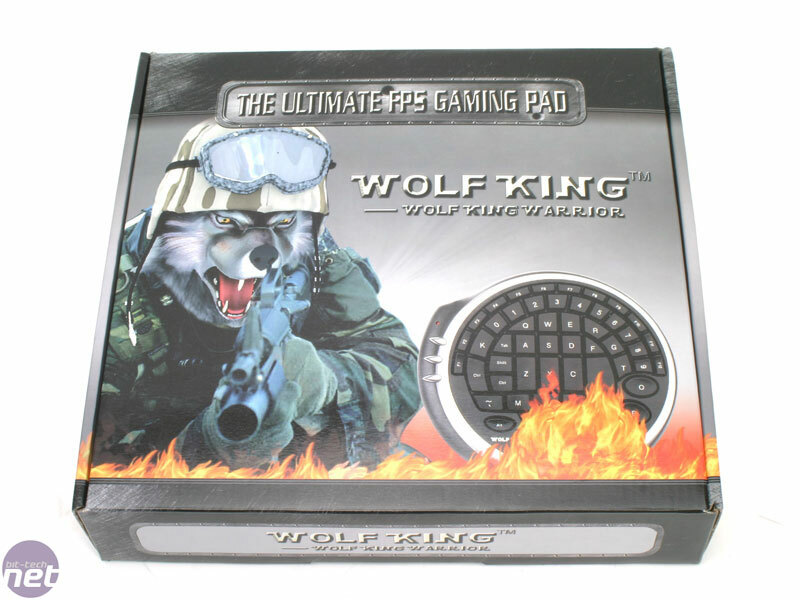 However, appearance can be deceiving and just because the Wolf King package looks a little tacky, doesn’t mean the product itself is. In fact, getting the actual product out reveals a satisfyingly high finish that feels anything but tacky. The Warrior itself is black with silver highlights in the form of three periphery buttons and a silver frame. 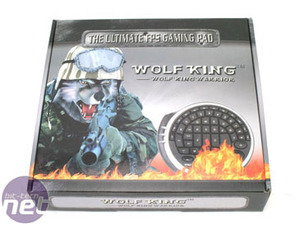 There’s only the one case of branding on the product, a single, simple Wolf King label in the lower left of the circular pad. Other than this and the red LED which lights up attractively when the pad is plugged in, the decoration is delightfully sparse. The lack of branding and stupid flame effects makes the pad look a lot more professional and classy, unlike some game pad controllers which favour carbon fibre finishes over a simpler look. The pad itself is a (pauses to count) 51 key pad (he had to count this several times, as fingers and toes only go up to 20 -- Ed.) 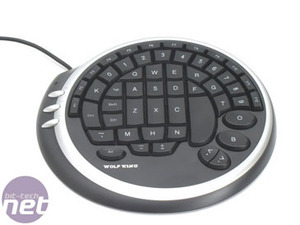 which uses a mixture of letters, numbers, F-keys, symbols and function keys arranged in a free-form circular configuration. To break that sentence down into a jargonless form; it means there are a lot of different buttons, two of which can be used to control the system volume, laid out in a circular mish-mash. The idea behind the pad is that it performs in-game by replacing the keyboard for your left hand while leaving more keys comfortably within reach. The layout clearly favours the right handed, hence the large vertical spacebar which falls under the left thumb and the two Ctrl keys which are intended for the left pinky finger. Looking over the pad before using it, the design seems excellent. 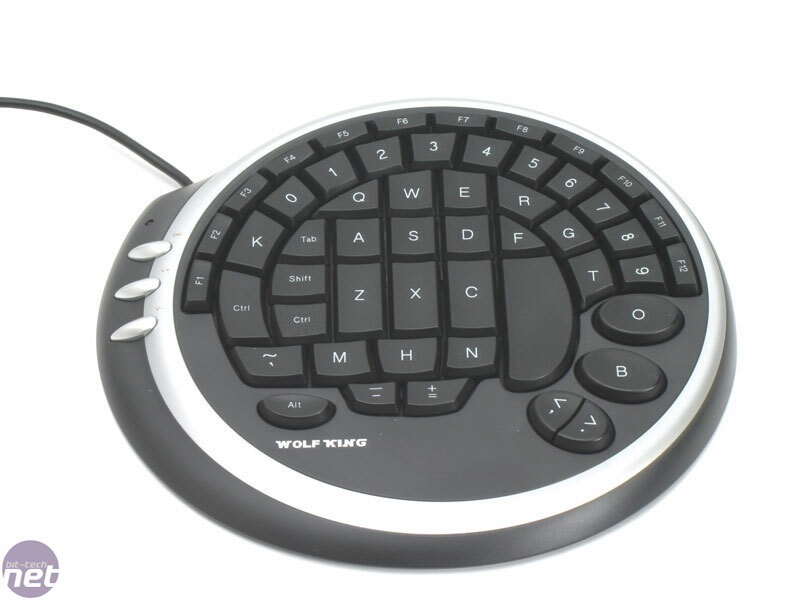 The WASD keys are perfectly spaced and the key response is firm without being difficult or noisy. The pad seems to overestimate the size of the average palm just a little as it takes some delicate finger ballet to reach some of the F-keys on the far left and right. 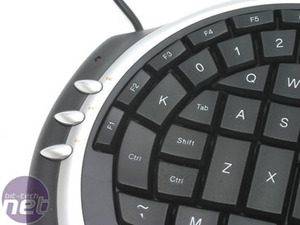 However, the number of FPS games which require use of the entire selection of F-keys is minimal (I can only think of Deus Ex off the top of my head) and the important thing is that the F6 and F7 keys, which are normally used for quickloading and quicksaving, are easily within tapping distance. Veho has announced a keyboard and controller hybrid peripheral. The Warrior XXtreme could be the best gaming keyboard solution we've ever seen, but the only way to tell is to go hands on with it and see how it handles. We give the new Warrior a full battery of gaming tests to see if it's worth the dosh or not.